This spiral staircase is 48" in diameter and has a 3 line rail system. Spiral stair handrail is # 215 (2") round brass tubing with an oil rubbed finish; intermediate spiral stair handrails are # 200 (1 1/2") round steel tubing spaced equally; spiral stair treads are # 133 (1" x 3/16") radial grate steel; and the center column is a heavy duty 3 1/2" ID steel schedule 40 round pipe. This spiral stair was fabricated in one section at our plant and then spliced into three sections for the hot dip galvanizing and shipping. Brass handrail is rolled and installed at our plant and disassembled before galvanizing. A few interesting details about this spiral staircase: base plate at the bottom of the spiral stair center column has be hidden by the flooring; this base plate can sit on top of your flooring or can rest on the subfloor and floored over;. if placed on the subfloor your flooring thickness becomes a critical dimension. When designing a spiral stair the spiral staircase steps can be based on aesthetics or practicality. The steps chosen for this application are radial grating. This spiral stair step design is contemporary in appearance but also practical since it will allow snow and ice to fall through though not good for bare feet or high heels. 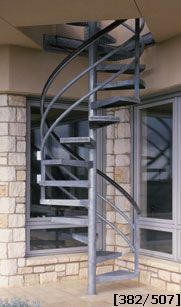 This spiral stair has a galvanized finish; an excellent coating for any exterior condition. A galvanized finish on a spiral stair can be painted any color to match surroundings.